Into the Labyrinth... 2001: The American Century had closed with a single Cold-War superpower standing, and a pause in conflict that some dubbed The End of History. It wasn't. In the Middle East and South Asia, an Islamic revival was underway, while resentment spread due in part to US support for the regions' anti-Soviet tyrannies. Thus erupted a new struggle against the West. Wealthy Saudi fanatic Usama bin Ladin declared holy war against America in 1996, and then struck with spectacular terrorist attacks on US targets in East Africa in 1998, and Arabia in 2000. Bin Ladin's al-Qaeda organization recruited and trained under the protection of an Afghan fundamentalism born of the anti-Soviet Bear Trap of the 1980s. By 2001, al-Qaeda had set in motion even more devastating strikes - this time within the US Homeland - in hopes of igniting a global Muslim uprising. Uprising or not, the West's response to those September 11th attacks would reshape international affairs from London to Jakarta, and from Moscow to Dar es Salaam. Labyrinth takes 1 or 2 players inside the Islamist jihad and the global war on terror. With broad scope, ease of play, and a never-ending variety of card combinations similar to GMT Games' Twilight Struggle, Labyrinth portrays both the effort to counter extremist terrorism and the wider ideological struggle - guerrilla warfare, regime change, democratization, and more. From the designer of the award-winning Wilderness War, Labyrinth combines an emphasis on card-driven game play with multifaceted simulation. In the 2-player game, one player takes the role of jihadists seeking to exploit world events and Islamic donations to spread fundamentalism. The other as the United States must neutralize terrorist cells while encouraging Muslim reform to cut off extremism at its roots. 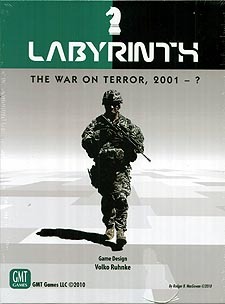 Labyrinth features asymmetrical game play and a maze of political, religious, military, and economic events. In the parallel wars of bombs and ideas, international coordination is key - but terrorist opportunities to disrupt Western unity are many. The Towers have fallen, but the global struggle has just begun. Let's roll! Labyrinth is one of the very best card-driven games (CDGs) released by GMT Games. I also liked the designer Volko Ruhnke's previous game, Wilderness War. Labyrinth covers the 'War on Terror' during the post-9/11 Bush era, up to about (but not including) the Arab Spring. The game is excellent. It has an expansion, 'The Awakening', which is strong too. It gives players lots of interesting choices of where to focus geographically. With both sides you can choose how radical your approach is: for the West, regime change or gradual disruption of terrorist cells? For the Jihadists, is it best to pursue WMD or convert countries into fundamentalist Islamic States? Furthermore, one of the very best aspects is the compulsory event cards: some cards can't be played for operations and, consequently, each game plays out like a unpredictable storybook. This makes the games enjoyable to watch and participate in - even if you lose! My only criticisms are that some of the spaces on the map (e.g., Russia, Sudan) are often secondary to achieving victory. Perhaps, more could have done to make these country boxes important. For the West, handling the plots is quite simple and the process could have been made more detailed, more like solving a puzzle, I'd suggest. The design, with some euro-type game features incorporated, is better in pure game terms than as a simulation of the events themselves. For example, when the Jihadists play the 'Saddam' event - simulating failure by Blair and Bush to neutralise Iraq - I don't feel it captures the true impact he would have had on geo-politics and terrorism. But these are all small points. I highly recommend it.